Garden Answers June 2005 "Chrysanths for late colour"
Amateur Gardening 18th October 2003 "AG reader's crazy for chrysanths"
They were awarded a Silver-Gilt medal. Helped Otley Museum with display information about plat breeder Fred Simpson and "Otley Koreans"
Autumn 2009 local U3A group visited twice. Autumn 2008 photographer Marianne Majerus came to take pictures. 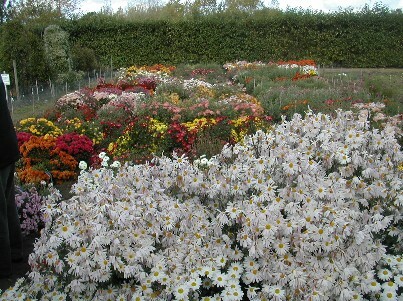 Autumn 2008 Professor Marks visited for late flowering chrysanthemums for Dulwich Park Winter garden. Plants exchanged. Autumn 2008 visit from Capel Manor Horticultural College, plants exchanged. Editor Gardens Monthly Magazine came down to take pictures and record an interview. Autumn 2006 two visits from National Chrysanthemum Society to register plants for the NCS Register. Over 100 registered for the first time under Section 21 Garden Forms. Autumn 2006 Mark and Elaine Trenear of Southview Nurseries visited. Autumn 2004 Rose Clay visited collection to take pictures for an Herbaceous workshop at RHS Lindley Hall, where she was giving a talk. 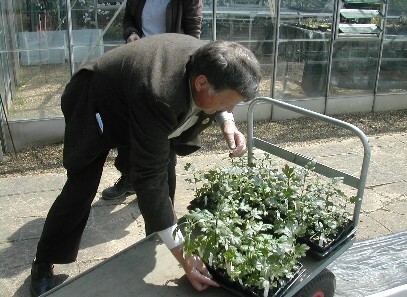 In the spring all the plants propagated by Andrew McDougall were ready for delivery to RHS Wisley for the Field Trials. Thank you so much Andrew for undertaking this task so willingly and in such a difficult winter which tested your greenhouse propagation space to the limits with all your other plants. The result in mid-October at Wisley "going out with a colour fix". The trials at RHS Wisley Deers Farm site will run from 2010-2012 undergoing full hardiness trials over two winters. Judy was at Capel Manor for their Autumn Weekend in October 2010 with a wonderful smell of apples as they were being turned into juice. Well worth a day out there. Helped identify and date chrysanthemum labels from an archaeological survey of a walled garden Sept 2010 This was fun to do, a good excuse to sit down with all my old books. 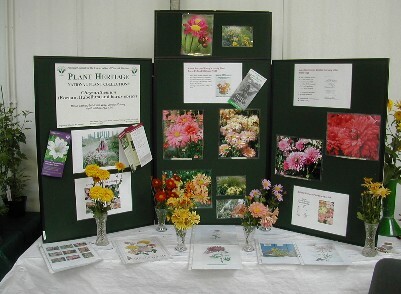 Submitted a completed Hardiness survey 2010 on the collection chrysanthemums to Dr John David RHS Chief Scientist this could be used in conjunction with the findings on the RHS Chrysanthemum trials.